I have been meaning to write this post as well as a newsletter all week, but I have had the misfortune of getting poison ivy on both my wrists and forearms making typing pretty uncomfortable. My first time ever having a reaction to poison ivy and let me tell you, it is no fun. Anyway, on to better things……. Last month I created four small paintings for the Good Mail Day exhibit at artstream studio and gallery up in Dover, New Hampshire. 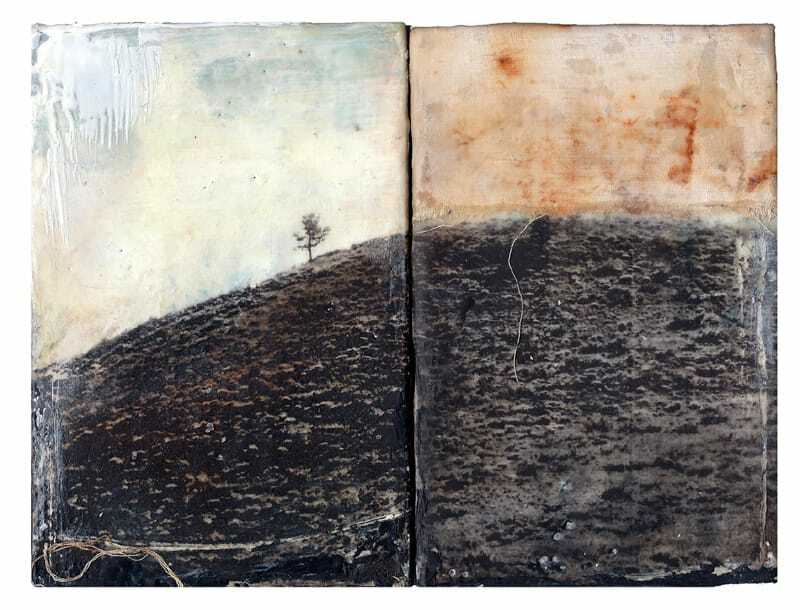 In the invitation for the show there was only one caveat- that the works needed to be 4×6 inches. For a while now I have been gearing up to paint bigger than is my norm, so I have to say that this was a nice excuse to go back to such a small, intimate size. Since the idea was that these works would be postcard size I decided that I wanted to create small pieces that really speak to a sense of place, much like a postcard. 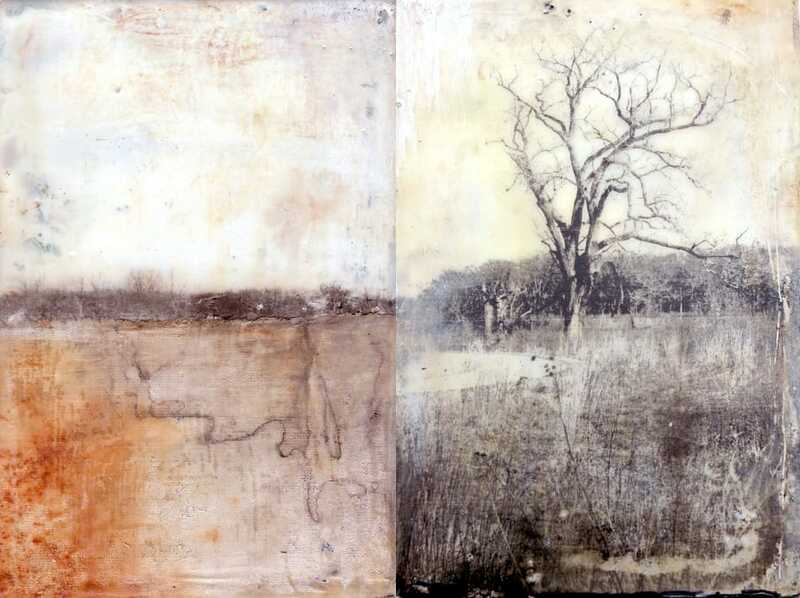 These two landscapes were made separately, but can hang together if one wanted to do so. The one of the left, Landscape 2, is dear to my heart, I have to say. The rusted and dyed cloth suggesting topography underneath the horizon makes me happy. I really love to bring in textiles into my paintings. Landscapes 3 and 4 again were made to either hang together or separately. I enjoyed taking a transfer of one of my photos and adding my rusted cloth to it to again evoke a landscape in an abstract way. To take something rooted in realism and yet somehow add a feeling of abstraction is like creating a bridge between two worlds- the concrete and the magical. Some of my favorite books fall into the magical realism genre, like Gabriel Garcia Marquez’s One Hundred Years of Solitude or Isabel Allende’s House of Spirits or Eduardo Galeano’s Book of Embraces, so I guess it’s not a big surprise to find that that is what I am often speaking to in my mixed media works. A dream world. Or a world that has one foot in reality and another in something that can’t quite be named. The opening for the show happened this past Friday, but will be up all month and next month. I saw photos online and there are more than just a few that I would love to own myself! Or at least see in person. If you are in the Dover area, be sure to stop in. If you are not in the Dover area, you’re in luck as they created an online gallery where you can buy a piece and the gallery will ship to you. How wonderfully convenient is that? I believe two of my paintings above sold opening night, but am not certain which one. If you are interested, please contact Susan at artstream. Or contact me if you have any questions. Diego had never seen the sea. His father, Santiago Kovadloff, took him to discover it. The ocean lay beyond the high sand dunes, waiting. When the child and his father finally reached the dunes after much walking, the ocean exploded before their eyes. And so immense was the sea and its sparkle that the child was struck dumb by the beauty of it. I love these Bridgette. Small gems. How clever to create pairs of art that work just as well together as separated. Amazing!